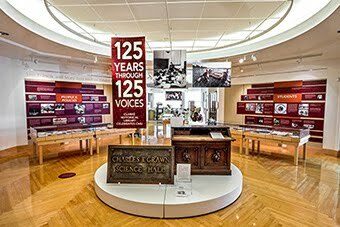 For several years now, the Clarke Historical Library has been working to digitize documents relevant to the study of Central Michigan University history. The Board of Trustee Minutes (1964-99), the entire run of Chippewa Yearbooks (1910-2003), and historical materials from the Student Government Association (2003-09) are just three examples of digital documents that are freely available to anyone in the world via the CMU Online Digital Object Repository (CONDOR) website. We are always adding to these great resources and currently, we are in the process of digitizing each and every Bulletin - undergraduate, graduate, Global Campus, and even the early Bulletins from Central Normal, as the University used to be known. As of this posting, Undergraduate Bulletins from 1986 to 2011 can be accessed via CONDOR. Among all of these digital records is a major resource for studying Central's history - the CMU student newspaper. 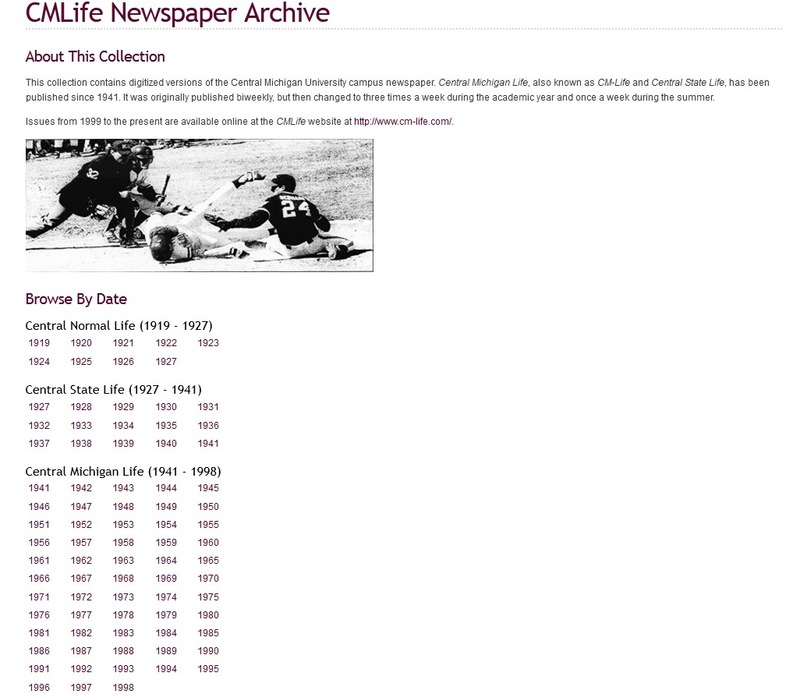 We are happy to announce that we have recently completed the digitization of the entire run of Central Michigan Life (and its previous incarnations - Central State Life and Central Normal Life). All of the issues from 1919 until 1999 are now available on the CM Life page of the CONDOR website. For over two years, our Preservation Microfilming unit, led by Kim Hagerty, has digitally scanned the microfilm of CM Life, cleaned up the images, used computer software that "reads" the text, attributed identifying information to the files, and finally uploaded the completed issues to CONDOR. The result is a full searchable collection of 80 years of newspapers chronicling the major and minor events in Central's history. There are first hand accounts of the fire that burned the Old Main building and CMU's Division II National Championship in football, which led to the ascension to Division I status as well as campus reaction to national and World events, such as the Exxon Valdez Oil Spill (pp. 3,4) and the Kent State shootings. This source now enables researchers far and wide to dig into CMU history from the comfort of their own computer. Whether it is CMU news, Mt. Pleasant News, or the local reaction to global news, the Clarke Historical Library and CONDOR are the home of the historical Central Michigan University student newspapers.